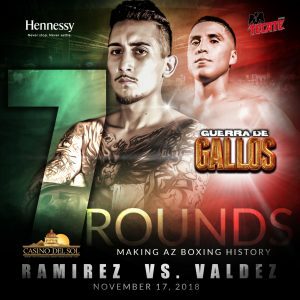 Tucson, AZ – Oct. 23 – When Tucson’s Jensen Ramirez (6-2-3, 1KO) squares off with Nogales’ Thomas Valdez (16-4-2, 6KO) at the Casino Del Sol’s AVA Amphitheater, it will be the first seven-round bout in Arizona’s history. The featherweight bout headlines the Nov. 17 event, dubbed Guerra De Gallos. The Nov. 17 card consists of eight fights, beginning at 7 p.m. Doors open at 6 p.m. This event is all ages. Tickets starting at $25 are available online at www.casinodelsol.com, by phone at (520) 333-5150 or at the Casino Del Sol Gift. Located in southwest metropolitan Tucson, Ariz., the Pascua Yaqui Tribe is a federally recognized tribe with nearly 20,000 enrolled members. The Tribe owns and operates several enterprises including Casino Del Sol, Arizona’s only AAA Four Diamond casino resort, one of the Best Hotels in Arizona named by U.S. News & World Report; Casino of the Sun; AVA Amphitheater, a 5,000-seat open-air concert venue named Casino Arena/Amphitheater of the Year by Casino Entertainment Awards; Sewailo Golf Club, a par-72 championship course designed by Notah Begay III; and the Del Sol Marketplace. For more information, call 1-855-SOL-STAY (765-7829) or visit www.CasinoDelSol.com. Follow Casino Del Sol on Facebook and Twitter.